It’s that time of the year again! Another round of the Flickr Doll Quilt Swap is underway. I decided to skip the last round since the send out dates were in early August and my baby was due around the same time. This time there is no impending baby to get in my way of quilting! Actually he still impedes my sewing time but that’s ok. I love those baby giggles. After seeing a bunch of “New York Beauty” blocks floating around Flickr I decided to give it a try. I’m still pretty new to the whole paper piecing thing but I’m loving how accurate the blocks turn out. Especially all those sharp little points. I only messed up once when I accidentally cut off too much seam allowance. It does take me a super long time to finish a block but I kind of like the whole process. This 1 block took me several evenings to finish. I only get to work on it in short few minute sessions so it’s hard to say how long it actually took to finish the block. I decided to have a little fun with the block in Photoshop. In a matter of minutes I had this lovely layout. If only quilting was as quick as Photoshop! 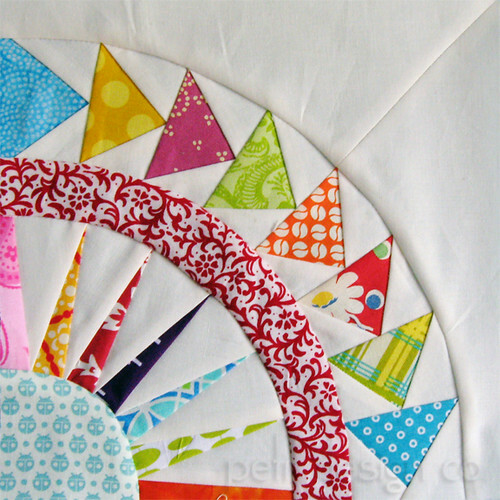 I really like this layout and can just imagine the quilting possibilities for that empty spot in the middle. I love that layout! So I'm doing a tiny swap for the NY Blocks, like a pillow/mini and the due dates is May 15th - did you want in?? Wow! I love this block; please be for me! Your NYB quilt is gorgeous. I always love bright colors on white. It just moves me somehow. Lovely work. 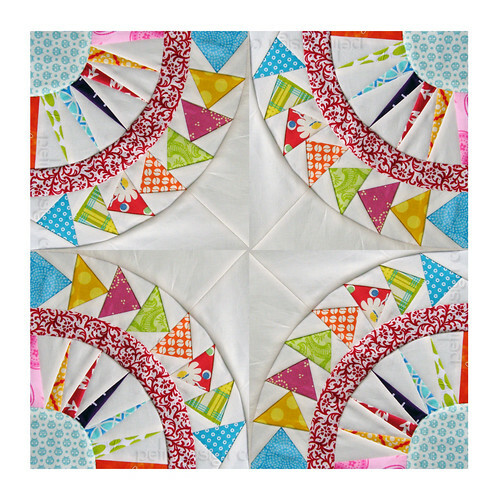 I may just have to try this paper piecing thing. I love the layout of this block... and how it makes a cathedral window. It was the inspiration for inverting my color wheel quilt. Can't wait to see it finished. Did you draft the pattern yourself or is this something available for purchase. I am madly in love with your block(s)... Thanks for the advice. Beautiful work! Its lovely! Great color choices. I just finished my first NY Beauty and I am hooked! On my blog if you want to see. This is so beautiful! Can you tell me which pattern it is? !